Are you planning your wedding flowers and centerpieces at the moment? Do you wonder what trends are going to be popular next year and into 2019? I spoke to the fantastic Gemma from Booker Flowers and Gifts to find out how fashions in floristry are changing going into the next year. What trends have been most popular in 2017 so far? A rustic look is popular – with trends of outdoor or festival style weddings. Bouquet styles are getting a freer look with bouquets having a ‘messier’ look with greenery and trails. The style is larger and wilder with lots of colours. In keeping with this theme is the mason jar style table arrangements and the more traditional style pedestal arrangements being on top milk churns. Gypsy grass has also continued to be popular this year and lends itself to a tamer version of this style. Blush pink – while still popular has definitely reduced this year. What changes in trends are you noticing going into 2018/2019? 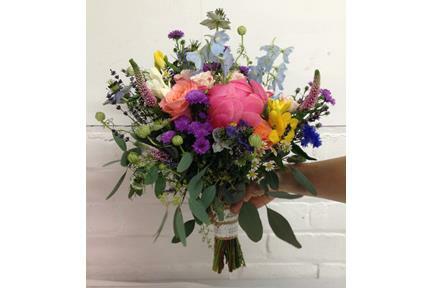 Bouquets are taking on a more natural look, with lots of textures being as important as colour. Foliage choices are increasingly being seen as important as the flowers. We are also seeing the groom having input into the flower choices, with flowers and accessories often been chosen because they have particular meaning to the couple. There does seem to be a moving away from mason jars, although there is still time for that to change. What colour themes are most popular for couples booking for next year? Dusky Lilac seems to be the new blush pink with lots of brides opting for this more vintage looking colour. Are there any particular types of flowers that are becoming trendy? Succulents, daisies, dahlias and vintage-y colour roses in brown / sandy tones. What affects the changing trends in wedding floristry? The catwalks, Celebs and general mood of the economic / political climate. What are your personal favourite styles of arrangements to do for weddings? My personal favourite is tidy ‘just picked’ style bouquet so lots of different shapes of flowers but artfully set out. I also prefer coloured bouquets over all white. How far in advance does a couple need to book you for their wedding? It does vary I would say an average of 1 year –however you do find ‘summer’ brides tend to book earlier 1 ½ – 2 years in advance and ‘winter’ brides tend to be more like 6 months to a year. Please give us your best advice for couples currently planning their weddings! The best time to contact your florist is once you have chosen your dress and bridesmaid colours as this is when you will have a clearer idea of your theme. Gemma has been a florist for over 10 years. Her shop, Booker Flowers and Gifts, is located in South Liverpool. You can pop in to the shop, ring them on 0151 724 4850, or email info@bookerweddings.co.uk.